Anthony Armstrong is an eighth-grade social studies teacher at Del Mar Middle School in Tiburon, Calif. I've asked him to check in regularly about all the ways in which he uses the benefits of technology in his classroom. Here's his first guest blog. The Internet provides a wealth of digital assets for both students and teachers. To help educators navigate the digital world and to integrate technology in the classroom, the International Society for Technology in Education (ISTE) came up with a set of guidelines a couple of years ago. To that end, here are some of the resources I use in my social studies class. But even more important than meeting standards, these tools help me to differentiate my instruction and strengthen my students’ learning. iTunes U - Provides free digital content (videos, podcasts, and PDFs) for a host of different academic fields from the nations top educational colleges, organizations, and museums. For example, check out a primary source video of Annie Oakley (#34) compliments of the Library of Congress and the early films of the Edison Company. Use the iTunes U Power Search feature to quickly find content available to your subject’s discipline. 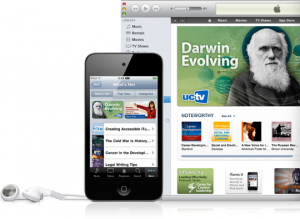 Like iTunes U, Hippocampus’s multimedia content includes high quality video and text resources. There are also small assessments included in some of the learning modules. Despite being designed primarily for grades nine and higher, I've used Hippocampus with my 8th grade students to great effect. YouTube can be an excellent resource for digital content. The large majority of schools block YouTube access to both students and teachers on campus. But you can still use videos in class, if you download them at home for use during the school day. A great tool for that is the 1-Click YouTube Video Download extension for Firefox. Just add this extension to your Firefox browser and you'll see below your YouTube videos a menu that will enable you to download the video in a FLV, MP4, or 3GP format to your desktop. Educators, what tech tools do you use? I'd love to hear other recommendations for helping teachers make use of digital resources with their students.